Cookies for breakfast? I’m in. These breakfast cookies are a portable way to get all the benefits of a healthy bowl of oatmeal in the palm of your hand. Without all the dripping and mess. I originally made this recipe to try and break my son of his two cereal bar a morning habit, but he is too freaked out by the cookies for breakfast concept to try them. More for me, I guess! My recipe calls for craisins, sunflower seeds, and pecans to amp up the nutritional factor of the cookies, but you can substitute your favorite oatmeal mix-ins: raisins, diced apples, walnuts, etc. If you find a combination of flavors that is out of this world, let us know so we can try it too! Mix all ingredients together. Spoon the dough by teaspoonful onto a greased cookie sheet. Bake at 350 for 15 minutes. Cool and serve. Leftovers can be frozen. EDIT: Several readers have asked for the nutritional information for this recipe. 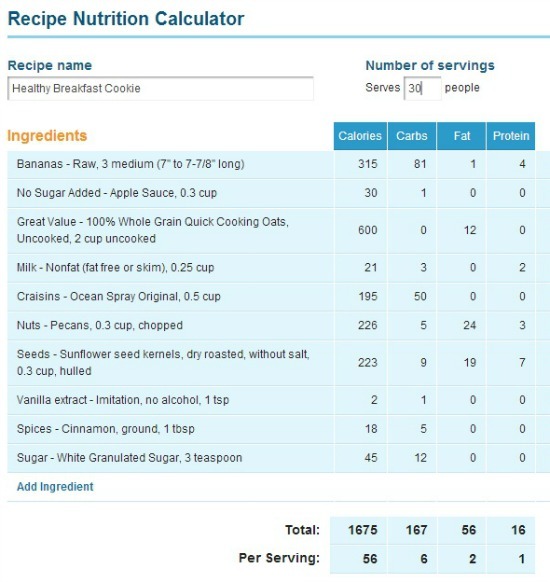 I used an online nutrition calculator and estimate amounts and ingredients as best I could. I can’t vouch for the accuracy of the information from this third party site, but it should give you a good idea. I just made these and I am wondering why you add milk. They were ok but I had to bake them much longer because they were so wet. I would leave out the milk next time. Do you refrigerate left overs or just leave them out i want to make like a batch for a week what are your recommendations on how long they can be out? I left them in a sealed container on our counter for a few days, but by then they were all done. I am sorry I can't give you good recommendations for how long they will last. You should be able to freeze them in small batches if that helps.